A homemade pound cake recipe is something to treasure. Pound cake is a classic that has been around for generations. It's the perfect all-purpose dessert-a thick slice of pound cake can just as easily be enjoyed with morning coffee as it can be dressed up and lavishly frosted for a birthday cake or drizzled with strawberries and sugar syrup for a casual weeknight dessert. A basic homemade pound cake recipe is easy to tweak. The cake is dense and heavy (hence the term "pound cake"), with a moist, vanilla-like crumb, but it can be altered with fruit or flavor extracts, fresh fruit, or cocoa and chocolate to make a chocolate pound cake. Cream cheese, sour cream, buttermilk, and coconut pound cakes are also popular. 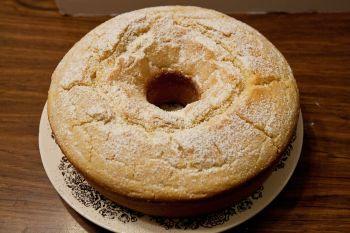 Pound cakes are traditionally baked in Bundt cake pans, making them appear as decorative rings. This recipe makes one 10-inch Bundt cake and serves about 12. Preheat the oven to 300 degrees F. Grease the Bundt pan with butter and lightly coat it with flour. Cream shortening, butter, and sugar together in an electric mixer until light and fluffy. Allow three to five minutes to combine the mixture thoroughly. Turning the mixer speed to low, add eggs one at a time, beating well after each addition. Combine the baking powder and flour. Stir 1/3 of the flour mixture into the batter, and then stir in half the milk. Repeat with another 1/3 of the flour mixture, the remaining half of the milk, and finally the last 1/3 of the flour mixture. Bake for one to one-and-one-half hours or until the cake is golden brown and a toothpick inserted into the center comes out clean. Let the cake cool in the pan for 10 minutes. Then turn it onto a wire rack to cool completely. Store homemade or store-bought pound cake in an airtight container or wrapped tightly in plastic wrap for up to two days. After that, it may become stale. Pound cake can be stored in the refrigerator, wrapped tightly in plastic wrap and kept in an airtight container, for up to a week. Some cakes don't freeze well, but pound cake does. Wrap cake tightly in plastic wrap, place it in an airtight container or large Ziploc bag, and freeze for up to four months. Before creaming the butter and shortening in the cake, bring them to room temperature. Do not microwave them or melt them. Don't stir the cake too long after adding the flour mixture, or the cake will become tough. When possible, keep the oven door closed until most of the baking time has passed. Opening an oven door to check on the cake will cause the oven to lose heat. Prick the toothpick test for the cake near the center, which is the part most likely to be under baked.